Two major RPG sourcebooks, Wizards of the Coast’s D&D Sword Coast Adventurer’s Guide and Paizo’s Inner Sea Races for Pathfinder, both came out in the last few weeks! Here’s why you should skip them both, no matter what RPG system you’re using. These two books are similar in a lot of ways. They’re from the two biggest publishers in tabletop RPGs and are both focused on places and people within each respective game’s “home” campaign world; for D&D, that’s the hoary old Forgotten Realms, while for Pathfinder it’s Golarion. The D&D book retails for $40, the Pathfinder one for $45. And they both seriously miss the mark in terms of providing value to players and DMs. The Sword Coast Adventurer’s Guide is especially disappointing. It’s really the first book Wizards has released for fifth edition D&D that isn’t a dreadfully long hardcover adventure campaign, but if you were hoping for a some quality splatbooks to expand your D&D campaign, you’ll have to keep waiting. The back cover copy claims it’s a “valuable resource for Dungeon Masters and players alike... contains a plethora of new character options.” None of those things are true unless you define plethora very loosely. It’s about 150 pages long and feels a little on the thin side for $40. The first 120 or so pages offer a tour of the Forgotten Realms and describe how the various D&D races fit within that world. There isn’t a single game rule or statistic to be found, which might be fine if this didn’t feel like a reprint. The Realms have been described and redescribed in every edition over and over again—I doubt there’s anything here you couldn’t find in a wiki. There’s a nice map of the Sword Coast region, where we’ve been playing video games and introductory adventures for almost 20 years, but it’s a single page, not a foldout. Can we visit somewhere else in the Realms for a while? The final 30 pages or so are decent, offering new class options specific to the Forgotten Realms and some useful flavor, like new wizard groups to join, new deities to worship, and several new backgrounds. If this section was the gravy on an otherwise useful book, it would be perfect, but here it takes center stage, and this content just isn’t strong enough to make the book worth your time. The first 200 pages go over each race (and human ethnicity) in Golarion and talk a bit about how they relate to each other and the world, and why they might go adventuring. There are no rules or stats, just world-building stuff, but it’s hard to see what this adds to the information already provided by the Inner Sea World Guide. You might think they could save this in the last 50 pages with some great new rules crunch, but again, you can find all that in the Advanced Race Guide. There are some new magic items, spells, and racial options, sure, but not enough. And there are lots of new feats, but they’re all teamwork feats. In many years of playing Pathfinder and 3.5 D&D, I’ve never once seen a player take a teamwork feat. They’re marginally useful in extremely narrow situations, which makes them a total waste of time and pages. To some extent these books represent a bit of flailing, trying to sort out what kinds of books players want to buy. For Paizo it’s a misstep (albeit a mystifying one) in an otherwise solid lineup of rules expansions and adventure paths. 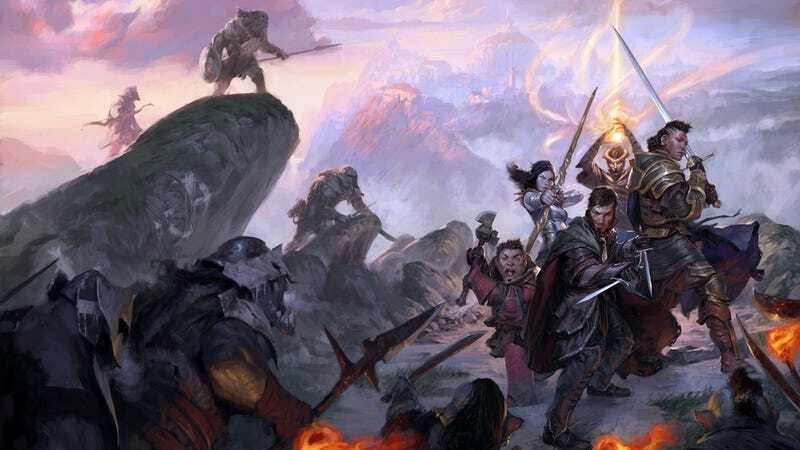 For Wizards, it’s a bit more troubling—in seeking to avoid the gradual increase in rules complexity that every edition of D&D has suffered from (including Pathfinder), they’ve focused on releasing epic adventures instead of rulebooks. Their first step away from that model is a disappointment. The bottom line for gamers is simply: hold onto your money.